Most of us have had at least had a hint of summer now, and with big events ahead such as Glastonbury, Wimbledon and the British Grand Prix, the British public will be taking an even closer interest in the weather forecast. 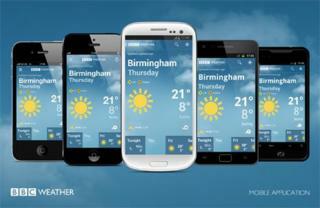 Which is why I'm delighted to announce that we have launched BBC Weather mobile apps on Android and iOS. Over the past year we've been working to offer you even more detailed weather information, including hourly forecasts for UK locations and three-hourly forecasts internationally. This has proven hugely popular with those of you who check the BBC Weather website, with many of you contacting us to say how pleased you are with this increase in data. We have also seen more of you visiting our website from your mobile devices and, with smartphone users growing overall, we have taken an opportunity to review how we can use this data to bring you weather information whenever and wherever you need it on your mobile. The launch of the BBC Weather mobile apps for Android and iOS marks a major step for us in beginning to meet this demand, and will enable you to access clear, detailed and up to date forecasts on the go with a simple click. The Android version is now available from the Google Play store and the iPhone version is available from iTunes store. We asked what you wanted from a mobile weather site. It became clear that one of the key needs is to get a quick forecast for the day. You want that information at a glance, with the option of digging for further detail when you need or want to. The BBC Weather apps allow exactly that. A tap on each hour-block exposes a detailed panel with fully detailed conditions for that hour including temperature highs and lows, UV reading and pollen count. You've said that it's important to be able to get the weather forecast for the next few days to help in planning. This is provided along the bottom of the screen and is always visible. At the moment the app has five days of forecast information, but this will be increased to match the website, as soon as we can. You've also told us that typing place names and storing favourites on mobiles can be tricky, and you are not always sure you have the best local forecast. In order to simplify and speed this up, you can take advantage of the location awareness of your phone and let your app do the work to quickly find a local forecast based on your current location. As with the website, you can search for postcodes, towns and cities in the UK. You can also search for many major international locations, so if you are planning a trip (or just curious where the sun has gone this summer), global forecast information is at your fingertips. Up to 10 of your location searches are stored automatically in the app so you can quickly view them in the location panel, or by swiping up and down to scroll through your list. The introduction of these apps, as I mentioned, is just the start of our improvements to BBC Weather on your mobile devices. We have listened to your feedback and we have focused this first release on the most highly used features from our website for you to enjoy during some of the summer's biggest events. We will of course continue to improve the apps, as well as our mobile website, based on what you tell us. In the past few months, we have invited hundreds of users to try out prototype versions, and take part in testing sessions, but we're still very keen to hear from you, so please try out the app and get in touch! You can contact us using the "send feedback" link in the app. We're also using the @bbcweather account on Twitter or you can comment below. My colleague James in Future Media provides more details on the features of both apps on the BBC internet blog and this will be followed with other blogs about the technical, design and accessibility challenges they face.